Chandrayaan 1, India'sfirst deep space mission, successfully entered lunar orbit early Saturday aftera circuitous two-and-a-half week journey from a seaside launch pad to the moon. The car-sizedspacecraft fired its liquid-fueled engine for 817 seconds to placeChandrayaan 1 in an oval-shaped parking orbit around the moon with a high pointof 4,662 miles and low point of 313 miles. That orbit will eventually belowered to a circular path about 62 miles above the lunar surface. Engineers monitored thecritical maneuver from the Indian Space Research Organization's SpacecraftControl Center in Bangalore. The probe had fired itsengine five times sinceits Oct. 22 launch aboard a Polar Satellite Launch Vehicle dispatched fromthe Satish Dhawan Space Center on India's east coast. 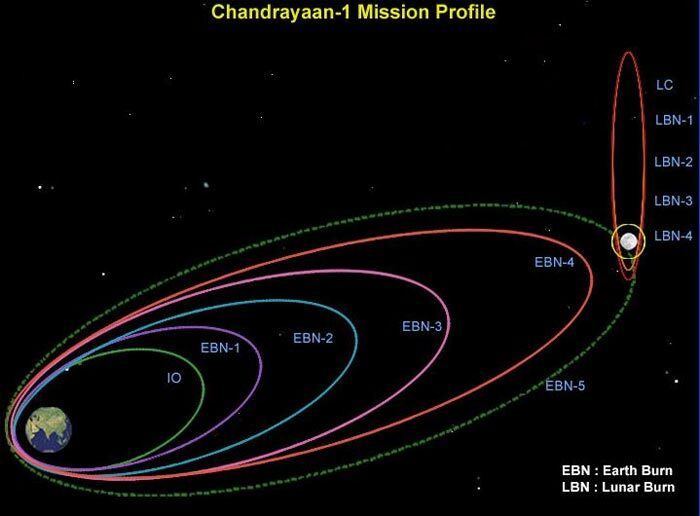 The burns graduallyraised the high point of Chandrayaan 1's orbit from about 14,200 miles to morethan 235,000 miles, according to ISRO. A graphic depicting thecraft's orbital trek can be seen here. Controllers also turned onthe probe's main camera at the end of October. The black-and-white stereoterrain mapping camera took pictures of Earth while zooming away from theplanet. The spacecraft's otherpayloads will be turned on and tested by the end of this month, before thespacecraft begins an operational mission lasting at least two years, officialssaid. Plans call for Chandrayaan1 to release a 64-pound impactor around Nov. 15 for a suicidal nosedive intothe moon. The trip from orbit to the lunar surface will take about a half-hour,and the small craft will relay imagery, altitude information and spectral databack to Earth through the Chandrayaan mother ship. Chandrayaan means"moon craft" in Sanskrit, the ancient language of India. The $80million mission is India's answer to a pair of lunar missions launched lastyear by Japan and China. Both countries' moon orbiters are still collectingimagery and scientific data. But unlike the Japanese andChinese missions, India invited large contributions from other nations to putinstruments on Chandrayaan 1. Scientists from Europe and the United Statesanswered the call. More than half of theprobe's 11 instruments come from outside India. The European Space Agency spent$8 million to fund three payloads, while NASA provided two more sensors.Bulgarian scientists also contributed a radiation monitor to the mission. Scientists expect data fromChandrayaan 1 to help create the most detailed global chemical map of the moonshowing mineral concentrations across the lunar surface. Researchers will alsomake a three-dimensional terrain map of the moon based on information yieldedby the mission. "We are going to lookat the moon slightly differently than the people who are looking at it (now).We're looking at the moon very systematically," said Mylswamy Annadurai,Chandrayaan 1 project director at ISRO. "We're going to make a repositoryof the whole moon and its contents." ESA's three instrumentscome from teams led by scientists in the United Kingdom, Germany and Sweden. "In an era of renewedinterest for the moon on a worldwide scale, the ESA-ISRO collaboration onChandrayaan 1 is a new opportunity for Europe to expand its competence in lunarscience while tightening the long-standing relationship with India ? an everstronger space power," said David Southwood, ESA director of science androbotic exploration. The ESA-funded X-ray andnear-infrared imaging spectrometers, called C1XS and SIR 2, will detect mineralsignatures in soil on and just below the lunar surface. Both instruments arebased on similar sensors that flew aboard Europe's SMART 1 spacecraft, whichwas deliberately crashed into the moon in 2006. "European scientistswill have the fantastic opportunity to continue our work on the moon,"said Detlef Koschny, ESA's Chandrayaan 1 project scientist. Europe's instruments aboardChandrayaan 1 will work closely with other countries' payloads to help fill inthe blanks in what scientists know about the moon. "The Apollo missionswent down to the surface, but only in a limited number of spots, whereasChandrayaan tries to do detailed imaging of the entire sphere of themoon," said Christian Erd, ESA's Chandrayaan 1 project manager. SARA, the other ESApayload, will observe solar wind particles contacting the moon's surface tostudy its effects on the top layer of soil. NASA provided a pair ofinstruments, the Moon Mineralogy Mapper and the MiniSAR radar, as part of theagency's effort to return to robotic exploration of the moon. "The opportunity tofly NASA instruments on Chandrayaan 1 undoubtedly will lead to importantscientific discoveries," said Michael Griffin, NASA administrator. "This exciting collaboration represents an important next step in what wehope to be a long and mutually beneficial relationship with India in futurecivil space exploration." The Moon Mineralogy Mapper,nicknamed M3, is a visual and near-infrared imaging spectrometer designed toplot mineral resources at higher resolutions than any instrument before. M3scientists from the Jet Propulsion Laboratory hope the device will help themcreate mineral maps to find science-rich landing sites for future missions. M3 will also look fordirect evidence of pockets of water ice hidden inside craters near the lunarpoles. Scientists believe there are frozen water deposits deep within theeternally dark craters due to high concentrations of hydrogen found there onprevious missions. The MiniSAR payload wasdeveloped by the Johns Hopkins University Applied Physics Laboratory. 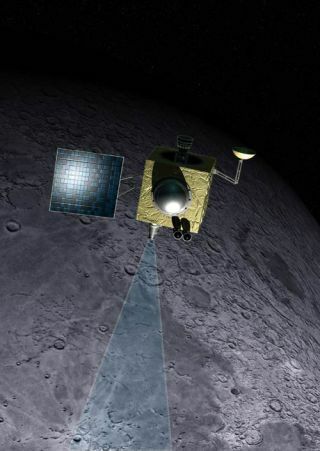 Theinstrument will bounce radar beams off the lunar surface to look for signs ofwater ice packed inside the walls of deep craters near the moon's poles. The combination of datafrom the M3 and MiniSAR instruments will allow researchers to determine howmany craters could harbor the frozen water, NASA officials said. India's indigenous suite ofscience payloads include a terrain camera designed to take detailedblack-and-white pictures of the whole lunar surface. The stereo camera will beable to spot features as small as about 16 feet, according to ISRO. ISRO scientists also builttwo spectral imagers, one focusing on near-infrared and another in the X-rayrange, to help produce precise global maps of the minerals and soil contents onthe moon's surface. A laser system was alsobolted to the spacecraft to determine its altitude above the moon and chartlunar surface topography. Indian engineers alsoconstructed the moon impact probe. "It has been the dreamof Indian scientists to send a satellite around the moon and then collect moredata about the surface features, minerals and so on," Nair said. "That dream is going to come true through this mission." Video - Japan's Kaguya Sees Full Earthrise!